This is a place where I will share articles from research I have compiled over a number of years on rare / specialist post 1950 French Sports Cars. I have posted all the articles I have written to date, but will be working on new ones as time permits and posting them when completed. You will have to excuse any errors but I invite you to add comments, corrections or updates below! In many ways, it is an attempt to redress the imbalance created by the ‘not made here’ or ‘not available here’ mentality that seems to pervade most English language publications …it is hard to find any decent material on anything other than mainstream European enthusiast cars. However, because I live far away in New Zealand, I have had little direct access to any data so what I have done is collect everything I can about each car and compare it for best fit – a bit like piecing a jigsaw puzzle together. Sometimes the most often repeated ‘fact’ about a car doesn’t seem to properly fit the picture… and then after much perseverance something turns up that makes more sense. And that’s how the stories have more-or-less evolved. I have endeavoured to cover everything I can about each car and the people behind them when the information is relevant, because in most cases there is unlikely to be a second chance to tell the full tale… This is why I am unlikely to write about Renault Alpine for example, as there exist some very good books on Alpine already… it is best to understand that for me this is not a competition, or an attempt to make an income (although that would be nice! ), it is an attempt to tell the stories of those sporting cars overlooked by history because they are deemed insignificant. The stories are essentially about the cars, and cars include initial design, construction and development, the thoughts and aspiration of the team behind the car, technical details specific to the car, and production and racing history… and driving! As stated elsewhere, I am an enthusiast at heart – I own one of only 4 or 5 Renault Clio 255 Sports existent in New Zealand. I also have a personal and professional interest in the whole spectrum of things that makes up any given vehicle. I hope this show’s in the articles. Enjoy! What a surprise to find an article here on Mismaque Squal. Thank you Philippe, it’s nice to reach people like yourself who enjoy such articles. I congratulate you on your excellent article on the French Velam and record breaker. I have been an Isetta owner and enthusiast for 38 years, yet i never knew about the Velam Record car, so you have simultaneously created and filled a huge gap which I didn’t know existed in my Isetta / VELAM / Romi / ISO knowledge. I maintain a Yahoo group called isettaWorld on behalf of the Isetta Owners Club of GB and from time to time I write articles for The Gazetta, our magazine, so could I please beg your permission to feature extracts from your article in a future issue ? Full credit would of course be given to you. Many Thanks, and again Congratulations for your article. I very much enjoyed your article on the Atla Renault. I would just comment there is one more Atla than those you specify in your article. There is also one in Sweden! 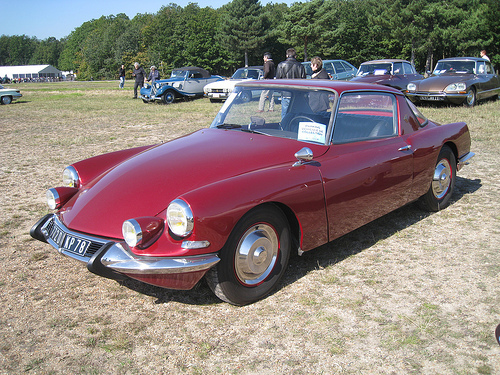 It was imported to Sweden in 1959 by the most well-known Renault tuner in Sweden, Arne Berg. He told me his car was said to be almost new, but when it arrived in Stockholm by boat in November, the Dauphine engine was frozen so Arne had to tow the car to his workshop. In the early 60s he raced the Atla on the 4CV/early Dauphine five-star wheels and had replaced the originally rear radiator with a front-mounted unit. First he had put in the front radiator as an addition to the original radiator to avoid over-heating, later on he realised there was no need for the rear radiator. Originally there was the ordinary 3-speed 289 Dauphine gearbox, but being also a Renault service shop, Arne put in an early 318 4-speed featuring 1,07 on 4th (1,035 on later 318s) before selling it to another Renault-buff. By then it had a Arne Berg-tuned and modified Dauphine engine featuring a Ferry converted 1063 cylinder head (four inlet and two outlet ports for twin double Webers) and the block re-bored to acommodate 63 mm pistons for 998 cm3. Arne sold the Atla when he had built a racing car of an early 1962 Renault 8 to the 1963 season. The Atla raced for some seasons before being “civilized” with a Renault 8 engine, gearbox and disc brakes and used on the streets as a sports car, but in the late 70’s it was put to rest for many years. Hello Leif, great to have your story added to the site. Thak you for writing. I hope you manage to finish it soon! I am currently finishing off a Ginetta G15 rebuild, but I also have a newer mid-engine Clio Sport 255. A good friend has a South American built Alpine 110 and an R5 Turbo II, and another a GTA. I raced my old Simca 1000 Special years ago. Would like to own a small French sports car one day, but they are rare in NZ..